A shipping profile is a way to streamline the process of entering shipping information by having Bonanza remember shipping defaults that you tend to use repeatedly. For example, if many of your items having optional shipping insurance for $5, and ship internationally for $10, you can create a shipping profile that remembers these pieces of information. Then, on either the New Item Form or in the Batch Editor, you can apply that shipping profile to your item to give you a good head start on populating the item with your usual shipping options. How Do I Create a Shipping Profile? Hover over "Selling" in the upper left-hand corner of any page and click on "Booth settings," then navigate to the Shipping & returns page and click "Add a shipping profile." A pop-over box will allow you to name your shipping profile and fill out whatever options you want to be associated with that shipping profile (shipping amounts within U.S., internationally, and/or shipping insurance). You can fill out as little or as much of this information as you want. 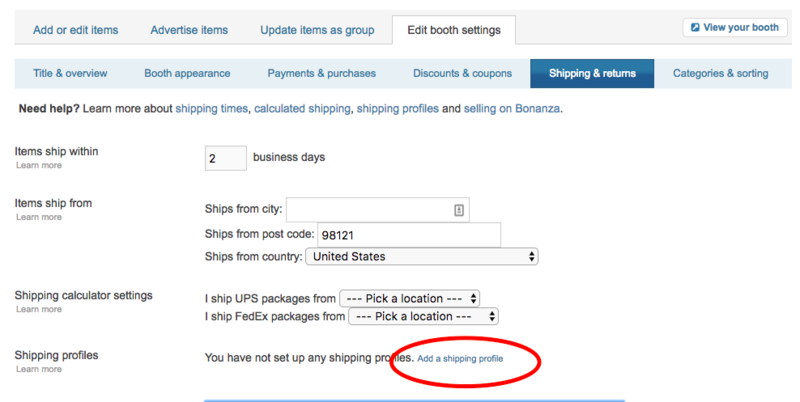 When you're done filling out your shipping profile, click the "Save Shipping Profile" button at the bottom of the pop-over box. Be sure to save all changes on your "Shipping & returns" page, as well. 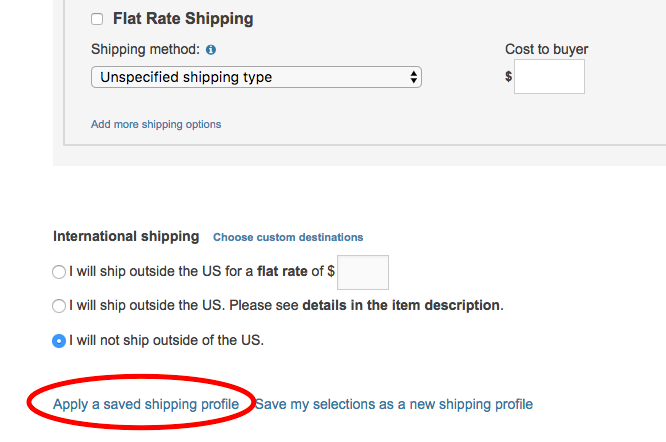 You can also save your specified shipping options as a shipping profile when creating listings via the New Item Form. How Do I Apply a Shipping Profile to my Listings? 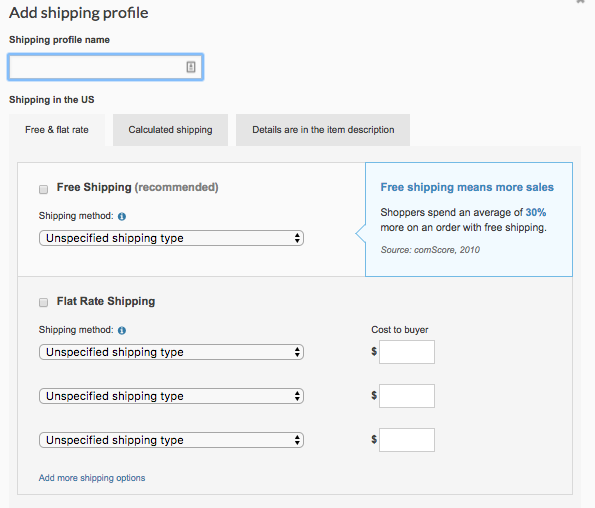 From the New Item Form: After you have created a shipping profile, you will be able to apply it from the new item form where you set your shipping preferences for your item (e.g., the list where you pick "flat rate," "calculated", etc.). Click the link to "Apply a saved shipping profile" and you will be able to select your preferred shipping profile from the drop down. 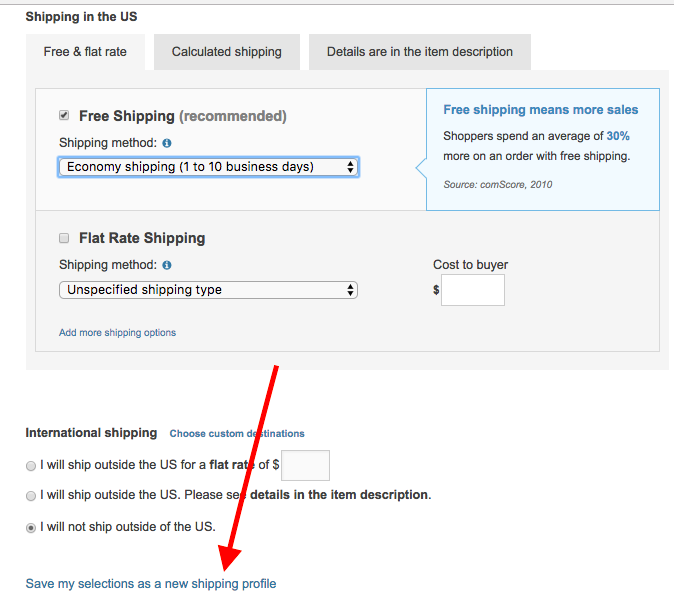 When you pick a shipping profile, all of the information you filled out in that shipping profile will be copied to the item. From the Batch Editor: Go to the "Selling > Batch edit items" page and select the shipping tab on the left side of the tool box at the top of the page. Select your listings you would like to apply the shipping profile to, and use the "Assign shipping profile" option. 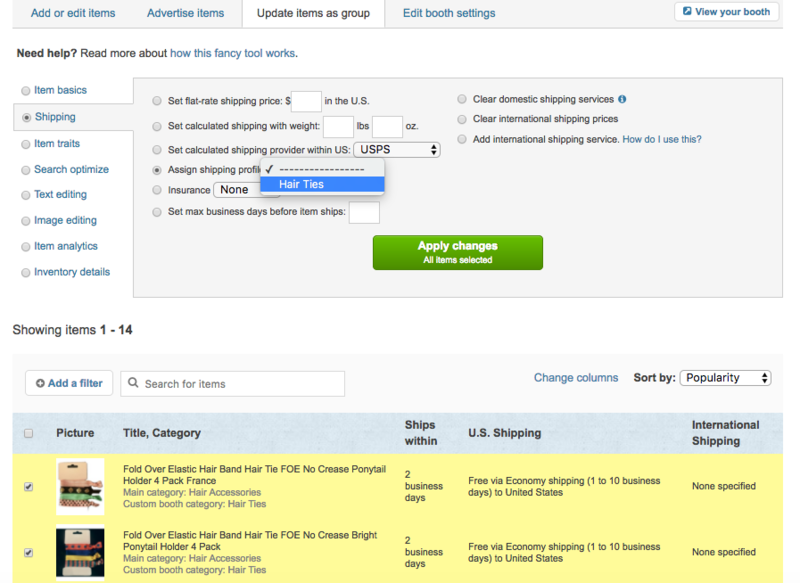 Select your preferred shipping profile and apply the change to your listings. As mentioned above, this action will delete any existing shipping information associated with said items, so use it with caution.